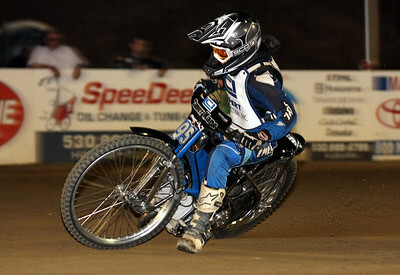 Red LIne Oil sponsored riders swept the scratch and handicap main events. Billy Janniro continued his scratch main winning streak and Kelly Kerrigan found the winner podium for the first time this season with an inpressive win in the handicap main. Billy Janniro looks back to check the competition. Tommy Hedden (L) and Bart Bast (R) get close in some great racing. Billy Janniro (L) and Kelly Kerrigan (R) face off in a handicap heat race. Both riders are sponsored by Red Line Oil and both picked up wins, Janniro in the scratch main and Kerrigan in the handicap main. Alex Marcucci (L) and Daniel Faria (R). 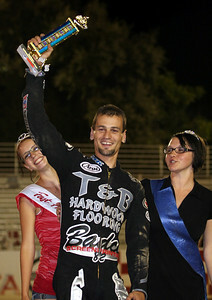 Tanner Kane won the Youth Div I Main Event. 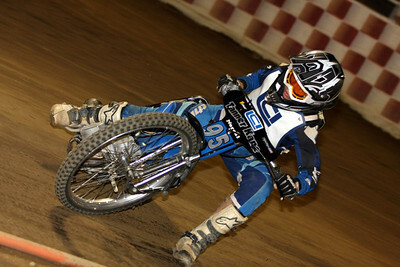 Billy Janniro (L) and Bryan Yarrow (R) had a great scratch heat race as Yarrow beat Janniro in a close finish. 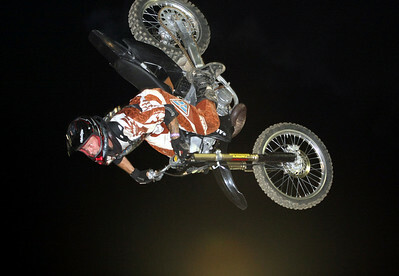 Tyler Polk did a back flip off the ramps. Back yardage handicap main event traffic jam. (L-R) Kenny Ingalls, Tommy Hedden, Bart Bast, and Billy Janniro. Daniel Faria celebrates his Div II win.